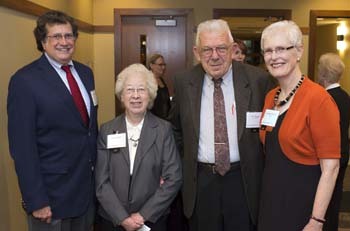 Among the many who gathered for the public launch of the campaign for Kalamazoo College were (l-r): Trustee Emeritus Phil Carra ’69, Louise Fugate, Professor Emeritus of German Studies Joe Fugate, and Chair of the Board of Trustees Charlotte Hall ’66. Kalamazoo College officials today announced that they have raised more than $84 million in gifts and pledges in The Campaign for Kalamazoo College, a $125 million effort intended to help K “elevate excellence” and “expand its impact” on and off campus. The College launched the campaign in March 2010. The anticipated end date is June 30, 2015. With today’s announcement, the College moves into a more public phase in which all alumni and other friends of the College will be asked to make a contribution to one of four campaign priorities: student opportunity and access, faculty excellence, K-Plan enrichment, and capital projects. According to Kalamazoo College President Eileen B. Wilson-Oyelaran, the impact of the campaign is already being felt. “More than $7.5 million in new student scholarships enables us to enroll highly talented students regardless of their economic backgrounds,” she said. “Six newly endowed faculty positions help assure that these students are educated by stellar teachers and scholars. “We have begun to strengthen the experiential programs that power the K-Plan,” she added, “including international engagement, career internships, leadership development, and student research. Nearly half of the estimated $20 million needed to replace the College’s aging natatorium and build a new fitness and wellness center has been pledged by donors. This entry was posted in News Releases, News Stories and tagged alumni, CampaignK, campus, community, faculty, students, . Bookmark the permalink.